Chris Paul and New Orleans Hornets are making noise in the NBA and so as Paul’s fourth signature shoe with the Jordan Brand. 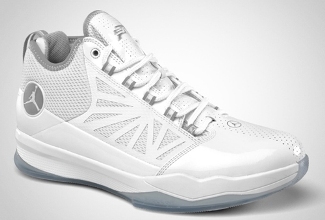 The Jordan CP3 IV, which has been released in various colourways in the past four months, will come out in another colourway this month, the White/Metallic Silver. And like the earlier release of this shoe, it is expected to be a hot item on the market because of its elegant design and especially its superb performance-based qualities. Isn’t it nice to wear a shoe endorsed by one of the best player in the world? So what are you waiting for, grab one now and you’ll get what you wish for. Jordan CP3 IV Now OUT! Jordan Play In These Q Making Its Debut This April!